My photograph shows a representative selection of the architecture of St John’s Wood High Street. In the left background are classical blocks, probably of the 1830s or soon after, of white or yellow brick with stucco details. Then, a bit closer, a red brick and white ‘Queen Anne’ group with the fancy curvy gables and the characteristic square-pane glazing of the late-19th century. There’s a lot of late-19th century stripy masonry round here, as witness the building in the right foreground, a bank, more classical but still in a contrasting mix of materials, here brick and Portland stone. 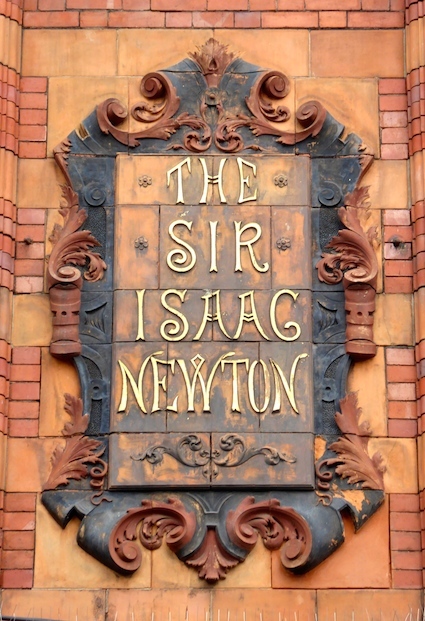 In the middle of it all is the pub, the Sir Isaac Newton, standing out like a flashing beacon. 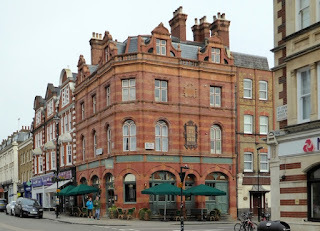 This is another late-19th century building (1892, says Pevsner), this time in red brick and orangey terracotta, a combination of colours that means that the bands are there but don’t provide much contrast. Instead, the whole building glows. Like its neighbour, it has ornate gables. The other stand-out feature is the integral sign on the side wall. This is bordered by rich foliate architectural ornament and within this border is some outré Art Nouveau lettering of the kind that people rejoiced in during the period 1890–1910. It’s a confection of bifurcated strokes, over-the-top spiralling curves (especially the S and C), curious concavities (the N, E and A), and sheer eccentricity (the W). 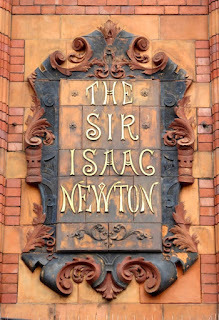 If we associate Sir Isaac Newton with gravity, this intoxicated lettering hardly embodies that characteristic. Perhaps another kind of gravity, specific gravity, comes to mind. Cheers! When in Salisbury I always look up at the sign of the White Hart Hotel, a particularly lovely three-dimensional inn sign that stands out against the sky. The building it crowns is a large inn of about 1820 with an enormous Doric portico, but there has actually been an inn here since at least 1635. The use of the white hart as a badge goes back further still – it was the device of King Richard II and that fact accounts for the crown around the creature’s neck. From ground level, everything is less distinct than in my photograph, which was taken with a zoom lens at full extension. Most passers-by are therefore unaware of the details of the sign. More often than not in my experience, the creature appears in silhouette, in which form he is still an effective marker, enabling one to single out the building from some distance away and forming a bold effect for an imposing building. *I'm not sure of the material used for the hart itself. The rough surface looks stone-like, but this may be the effect of a coat or two of masonry paint, plus grime. Could it be Coade stone? I thought I knew the Oxfordshire market town of Chipping Norton well but, as so often with places we visit frequently, there’s always another side street or two to explore, and I was delighted to find these 17th-century almshouses in Church Street. * You can see that we’re in the Cotswolds here: those stone walls and the broad gables built as upward extensions of the front wall are very Cotswold, as are the dripstones above the upper windows. There’s a datestone that tells us that the almshouses were ‘The work of Henry Cornish. Gent. 1640’. Cornish died in 1649 and left these eight houses as dwellings for eight poor widows, together with an endowment providing 20 shillings a year for the building’s maintenance and 2 shillings weekly for bread to be given to the widows. I don’t know much about Henry Cornish, but one source suggests that he was an opponent of the royal taxation that pushed England towards the Civil War and was imprisoned by the royalists for his views and bailed out by his nephew, William Diston, who’s remembered in the name of Diston Street, around the corner from the almshouses. Of course what attracted me to this building was, as so often, the fact that it’s attractive. The stone walls set back from the street behind a lawn have an air of tranquility. I hope it’s as pleasant a place to live in as it looks from the outside, and that many have benefitted from Cornish’s bequest and the way he acted on the instruction inscribed above the gateway: ‘Remember the poor’. 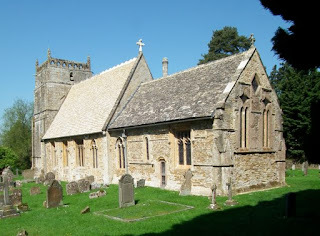 * Church Street: yes, I have visited Chipping Norton’s late-medieval church before, but managed to approach it from another angle, without going along Church Street. Lincolnshire is a county full of churches with elaborate curvaceous 14th-century window tracery. At big parish churches like the ones at Sleaford, Grantham, and Heckington, the tracery curves this way and that in a series of patterns of sometimes dizzying complexity and variety – curvilinear tracery of the most inventive kind. This is a smaller church, but the east window is as wonderful as those of its larger cousins. The tracery pattern here is dominated by two mouchettes – the shapes that look like gigantic skewed commas, their tails pointing down and outwards, their heads nodding towards each other and touching at the centre. Within each mouchette are other shapes – large multi-cusped trefoils in the heads, elongated ‘daggers’ in the tails. This is all very showy and was designed to hold stained glass which has not survived. The glass is clear now, so the sunlight pours into the chancel, as it was doing on the day I visited recently. And what the light falls on is equally remarkable: a series of niches, sedilia, and a piscina, all surrounded and topped with highly ornate 14th-century carving. Pinnacles, crockets, foliage, figures, human heads – this carving has the lot. A high-class carver has been here and has thrown the kitchen sink at this job. You can see why this style was labelled Decorated Gothic (often abbreviated to ‘Dec.’) in the 19th century. The niche to the right of the door is what eccesiologists used to call an Easter Sepulchre, which was thought to be a niche used in an Easter ritual in which the Crucifixion and Resurrection were symbolically re-enacted by ‘entombing’ a cross in the niche and removing it on Easter Day. Historians now question this, suggesting that niches like this were more likely used all year round for reserving the consecrated bread and wine. The imagery is certainly linked to the Resurrection – three Maries at the top with an angel, the Roman soldiers at the base. Whichever it is, the the carving is outstanding – it’s suggested that it was done at the behest of William de Herleston, who was rector here in the 1320s and was closely connected to the royal court. I can well believe that this work had such a high-status patron. It was with difficulty that I restrained myself from lying on my back and purring when I found this beautiful shop front in Lincoln’s Corporation Street. 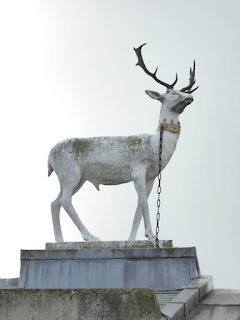 Restraint was a little easier than it might have been because of the number of other people present on the street and because of the poor 20th-century shopfronts on the building’s ground floor – I have spared you, gentle reader, from witnessing more than the merest sliver of these. There is much, decoratively speaking, to like about the facade. The fenestration, with the circular window and the curving glazing of the bays, is good, and some of the leaded lights remain to show how it would have looked back in 1899. The wall decoration with its gryphons, carefully positioned to frame the round window, is a joy. The gryphons are in plaster,† in very low relief, and have been emphasized by the pale blue paintwork of the background; I presume this would have been left white originally. There’s a niche in the middle of the wall, which would have housed a statue of one of the St Hughs associated with Lincoln.¶ Beneath this bit of Gothic finery is the carving around the name plaque, featuring scrolls, shields, and rampant lions. In spite of being knocked about, this frontage is still of enough interest to be protected by listing. 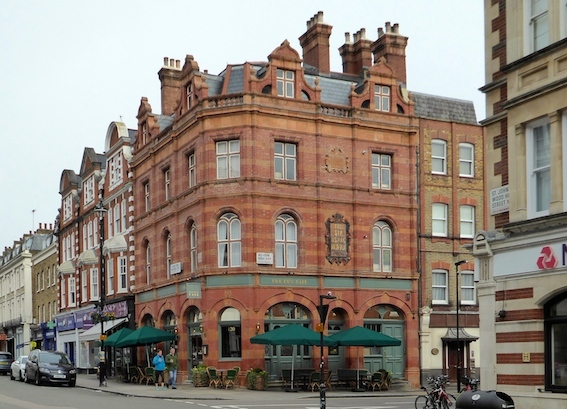 The listing text mentions it as a good example of a Victorian commercial building with decorations that suggest qualities such as respectability and dependability. To which perhaps I would add tradition (the use of heraldic beasts) and also a touch of daring (the sheer size of those gryphons). The Edwardian lawyers who worked there must have been proud of it. * ‘Chambers’ is the usual name for barristers’ offices, but solicitors are sometimes based in ‘chambers’ too. The word was also used for apartments, especially ones occupied by single people. † I have posted another example of this technique, called pargetting, here. ¶ Probably St Hugh of Avalon, the French-born monk who came to England to be prior of the first Carthusian house in England, and was subsequently Bishop of Lincoln. As an upholder of the rights of the Jews, a rebuilder of Lincoln cathedral, and a man who had the strength of character to stand up to that dynamic but difficult English king, Henry II, St Hugh gets my vote. 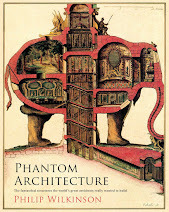 This is one of those architectural miniatures I particularly like. It’s St Mary’s conduit house, built in the 16th century to provide a source of clean water for the people of Lincoln. 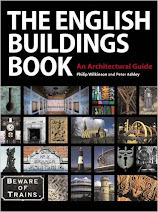 It’s said to have been built partly out of fragments of from a chantry in an old friary that was dissolved, during the depredations imposed by Henry VIII on the country religious houses, in 1530. By incorporating them into the walls of the conduit house (connected to a network of supply pipes begun by the friars) a few years after the dissolution, the builders gave a new life to bits of tracery and blind arcading, plus some corbels, niches, arch heads, and other bits and pieces. They also provided an invaluable service to local people. The conduit and others in the city carried on supplying water until 1906, although not the conduit house did not remain in exactly the same positron – it was moved away from the street into St Mary’s churchyard in 1864. When mains water was laid on at the beginning of the 20th century, the supply from the conduits was trusted more than the piped water. I seem to remember that there was widespread suspicion of piped water in the Victorian period, with London water sellers hawking water from bowsers with the cry ‘Pure water! None of your pipe sludge!’ And no wonder, given the disease carried by infected water supplies in the early days. In Lincoln, confidence in the old conduits continued during the 1904–5 typhoid epidemic, so perhaps this attractive facility saved some lives too. To Lincolnshire, in search of the Resident Wise Woman’s ancestors. Our journey took us to Potterhanworth, southeast of Lincoln, where her grandmother Betsy was brought up and went to the village school. 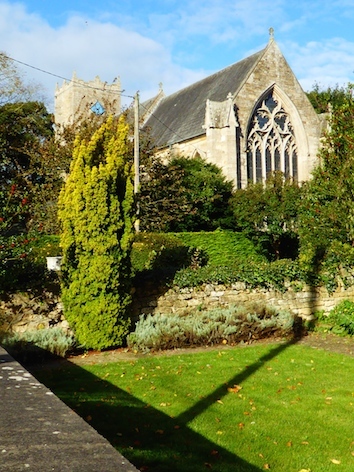 We took with us the Betsy’s typescript memoirs of her early life in this Lincolnshire village with her grandparents* – her grandfather (the RWW’s great great grandfather), the wonderfully named John George Pepperdine Salter¶ was the first stationmaster at Potterhanworth station. We found the old station house, where they lived, and visited the village school, whose head was very happy with the gift of a copy of the memoirs and rewarded us, quite unexpectedly, with the sight of their author’s name in the school register, inscribed in a copperplate hand in 1901. The most remarkable building in Potterhanworth is this water tower (now converted to a house). I can’t remember when I last saw such an impressive one in a village. It was built in 1903 with funds provided by Christ’s Hospital (a Lincoln charity with a lasting link to the village); the coat of arms of Richard Smith, founder of Christ’s Hospital in Lincoln are on the side of the turret. 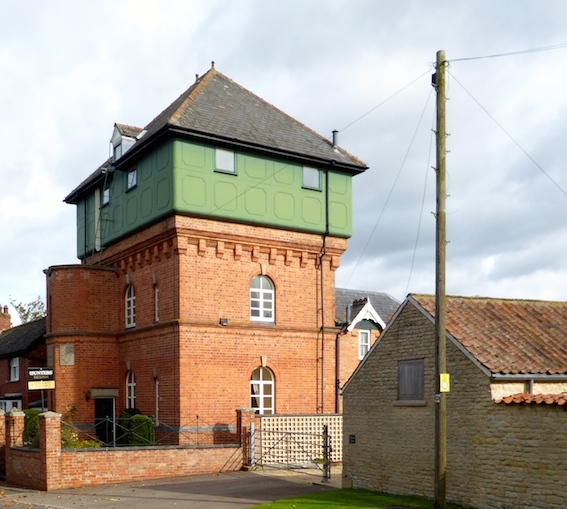 As well as supplying water (which it did until the 1970s), the building was a useful public meeting place – the Parish Council and Men’s Institute met in the rooms in the brick tower that supports the enormous tank. Now it’s a substantial house with an unusual history in a place that means a lot to those close to me, and now to me too. * So we are talking about a person born in the Victorian period brought up by her grandparents, who were old enough to remember the early years of Victoria’s reign – a long historical vista. ¶ I have a great fondness for names like this, in which it’s unclear where the forename ends and the surname beings; compare the writer Patrick Leigh Fermor and the photographic pioneer William Henry Fox Talbot. Just inside the entrance to the Museum of Lincolnshire Life in Lincoln is this post box. It was made in 1856 at the Handyside foundry in Derby and installed the following year at Gosberton Bank near Spalding. In 1969 is was moved to the museum, as an example of a very early type of post box – from the time before there was an accepted standard design. 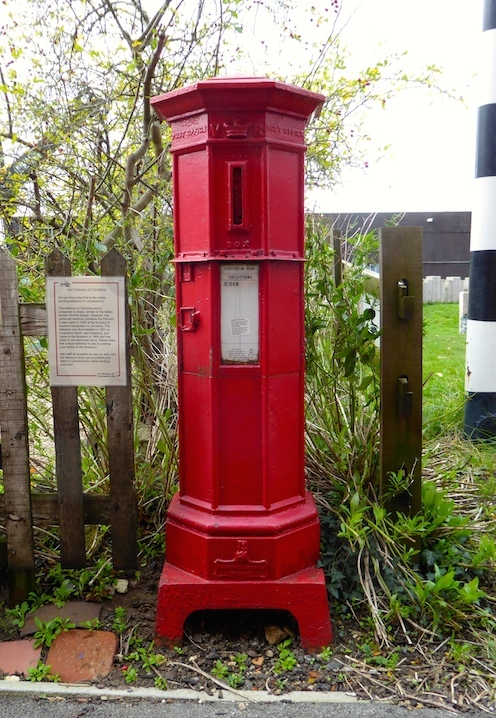 A number of the early post box designs were octagonal like this one and like the Penfold, of which a number survive. The Lincoln example, ten years earlier than the Penfold, is rarer still and almost as striking. With its vertical slot and octagonal shape, it looks quite unlike modern cylindrical boxes and as the red finish wash’t standardised until later, it might originally have been a different colour too. But many features – the royal monogram, the panel showing collection times, and the words ‘Post Office’ are all similar to those on the boxes we use today. I don’t often feature here items from museums, but there are so few opportunities to see these early boxes on the street that I didn’t want to let this one slip by. And there’s a twist. Although it’s in a museum, this post box is still in use, and visitors are encouraged to post their letters in it – this is Lincolnshire’s oldest working post box. As the first post box appeared on the British mainland in 1853,* it is also one of the oldest in the country. Mr Handyside did the Post Office proud. *The Channel Islands got them the year before.